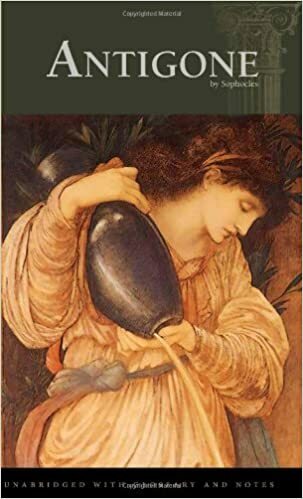 Antigone is chronologically the third part of the Oedipus Rex Trilogy which tells the story of Antigone, the daughter of Oedipus, after her father's death. The story opens at the end of a battle between Antigone's brothers, Eteocles and Polyneices, for control of Thebes. Both brothers died in the battle, but Creon, the new king of Thebes, has declared that while Eteocles should be buried with honors Polyneices body should be left unburied. This is a severe punishment for Polyneices since the Greeks believed that one could not go to the afterlife unless one's body was properly buried. Since she loves both of her brothers, Antigone decides to bury Polyneices in spite of Creon's order and tries to enlist her sister, Ismene, in the task. Ismene refuses to break Creon's law. Antigone says the law of the Gods is more important than mortal man's law. It is ironic that just as Antigone is burying her brother, Creon comes on stage declaring that anyone caught doing so will be put to death. When Antigone is caught burying her brother, she makes no apology, declaring that she is only doing what is right. Creon is a proud man and no amount of convincing will make him change his mind. The plot thickens as it comes out that Creon's son Haemon is engaged to marry Antigone. He tries to use reason to convince his father that killing Antigone for burying her brother will make him unpopular and hurt his rule. Creon accuses his son of disloyalty and sends Antigone to be locked in a cave with only limited food and water thus sending her to her death. Finally, Teiresias, the blind prophet who foretold the tragedy of Oedipus, arrives and manages to convince Creon to change his mind by foretelling of the deaths that will come from this Creon's action, but it is too late. When they get to the cave, Antigone is already dead, a suicide. Haemon also commits suicide and upon learning of her son's death, Eurydice, wife to Creon, follows her son's example. Creon is left with nothing but his kingship He had put his pride and his power ahead of his family and angered the gods. Although he kept his kingship it was poor consolation for losing both his son and his wife. This page was last modified on 18 January 2018, at 18:45.